In uncovering the hype behind sensationalized reports on girls and violence, the authors view juvenile delinquency as a social construction. In researching the number of violent girl crimes throughout the twentieth century, they assert that girls are less likely to commit violent crimes than boys. However, they note that girls make up a large percentage of juvenile delinquents and custody cases due to status offenses, so-called crimes in which girls can be arrested and tried for non-criminal behavior, such as sexual immorality. Connecting the courts' motivations behind status offenses to women’s political movements, the authors make a convincing argument that girls have often born the brunt of a sociopolitical backlash as a parallel when women's movements are afoot.At these pivotal moments in history, juvenile court systems have tightened their surveillance of girls’ behaviors and criminalized girls’ sexual expression. As a result, Sprott and Doob argue, girls have historically been punished, and continue to be punished, for behavior and actions considered normal and acceptable for boys. The authors discuss the limitations of their research, acknowledging the absences in their data with regards to race and class. Another absence in the book is a discussion of queer girls as well as trans girls and boys. Since sexual immortality—one of the most common status offenses girls are cited for—is not discussed at length, it is unclear if any of the girls convicted of this offense were/are queer or trans, and how their sexuality and/or gender identity influenced a court’s decision. Moreover, besides examining one case study, the authors do not offer girls’ own voices or their stories. Instead, they allow statistical evidence to speak for the injustices girls face in juvenile justice systems. 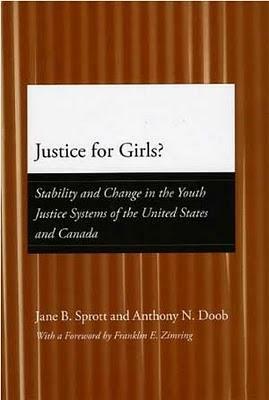 As a feminist scholar interested in the intersection of girls’ studies and media studies, I would argue that Sprott's and Doob’s work could benefit any researcher addressing the current hype surrounding girls and violence in contemporary Western societies.